I made this dish the other night and posted the pic on social media and received a bunch of questions about the filling. So, I thought I’d let you in on the secret to my vegan ricotta cheese replacement. In this recipe I grill the eggplant to make it a little lighter, but if you want to bread and fry the eggplant instead, it’s phenomenal. This is also an easy recipe to make ahead of time. You can refrigerate overnight and pop in the oven before your guests get there. And if eggplant isn’t your thing, this is great if you use Swiss chard leaves to roll this up! Slice the eggplant lengthwise, set in a colander and sprinkle with some salt. Let sit for about 30 minutes. In that time, make the filling. Using a potato masher, smash the tofu till it’s mud like. Add in all the rest of the ingredients and stir well. If the mixture is a little dry, add in more “milk” product. 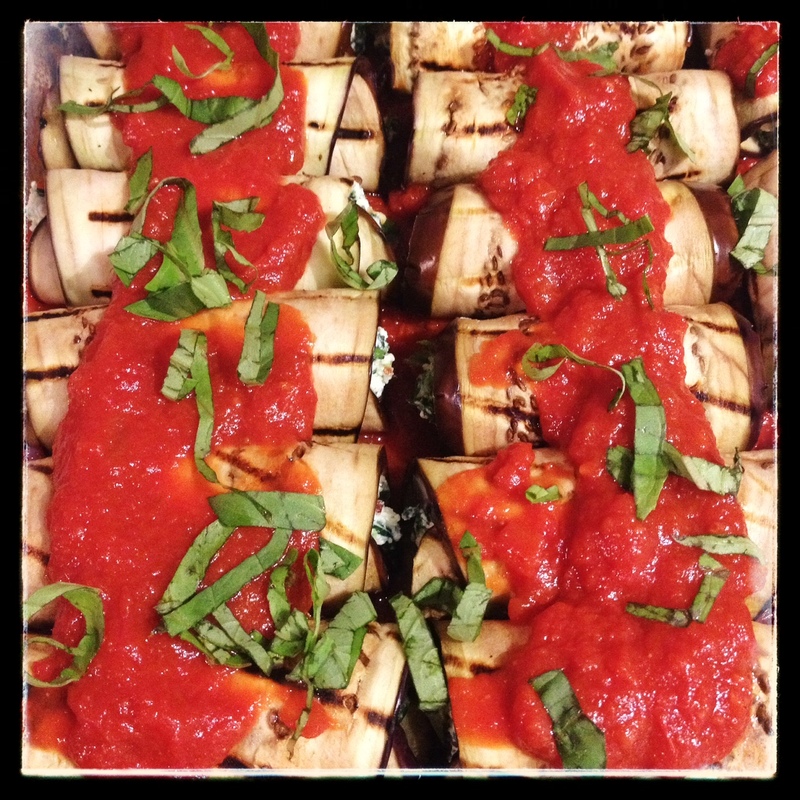 Wipe the eggplant slices dry and grill either on an outdoor grill or inside on a grill pan and set aside. In a 9×12 baking dish, ladle a couple spoons of tomato sauce into the bottom of the dish. On a clean workspace, lay a piece of eggplant down and place a dollop of tofu mix on it. Roll up and place, seam side down, in the baking dish. Repeat until you use all the eggplant. Cover the rolls with a few spoonfuls of tomato sauce and bake for 30 minutes. Serve with some pasta on the side and some additional tomato sauce. Hey Leslie! Thanks for the recipe! My vegetarian friend Esther came for lunch on Friday and I never know what to make for her! (begin Argentinean-meat-lover!) But the eggplants were great! Not only did she love it, but me and my husband loved it!! My sister Caro recommended this site…And know I am recommending it to all my Spanish friends! Do you place the tomato sauce in the bottom of the pan if you’re putting it in the fridge overnight? I’m worried it’ll make the whole thing soggy. Thanks!